Few teams entered the 2016 NCAA tournament hotter than the Kentucky Wildcats. And after a decisive 85-57 first-round victory on Thursday, not only did the Stony Brook Seawolves — yes, you read that correctly — experience this firsthand, but the rest of us got to see just why John Calipari’s crew is one of the favorites to win the whole thing. Of course, if you ask us, not even a national championship will put this year’s team on the same level as that Kentucky group from 2011-12. That bunch was special. By the time the 2011-12 college basketball season was over, there was no question as to which team stood at the top of the mountain. Coach Cal’s Wildcats were 16-0 in conference play, had a 38-2 overall record, and cut down the nets as the blue and white confetti fell on their heads. And like most of the recent Kentucky teams, this one was led by a talented and youthful group, including the standout of them all, Anthony Davis. As we get further into this year’s dance, we’ll soon learn if any of Kentucky’s players will be able to rise to the occasion. But one thing remains clear, back in the 2012 tournament, one individual we call “The Brow” was more than ready to seize the moment. Here’s a look at three perfect examples of that. When you’re the No. 1 team in the country, you can expect that everyone you face will be ready to give you their best shot. Especially come tournament time. However, when Kentucky went up against the No. 3-seeded Baylor Bears in the South regional final, John Calipari’s club was poised to make a statement. And as the team from Lexington, Ky. has shown in recent years, it was all about the freshmen. While Davis was not the team’s leading scorer (that honor belonged to Michael Kidd-Gilchrist with 19), he set the tone that allowed the Cats to jump out to a 42-22 halftime lead. By the time the game was over (with a final score of 82-70), The Brow finished with 18 points (6-9 FG, 6-8 FT), 11 rebounds, one assist, two steals, and six blocks. Not bad for a player who saved his best for the Final Four. 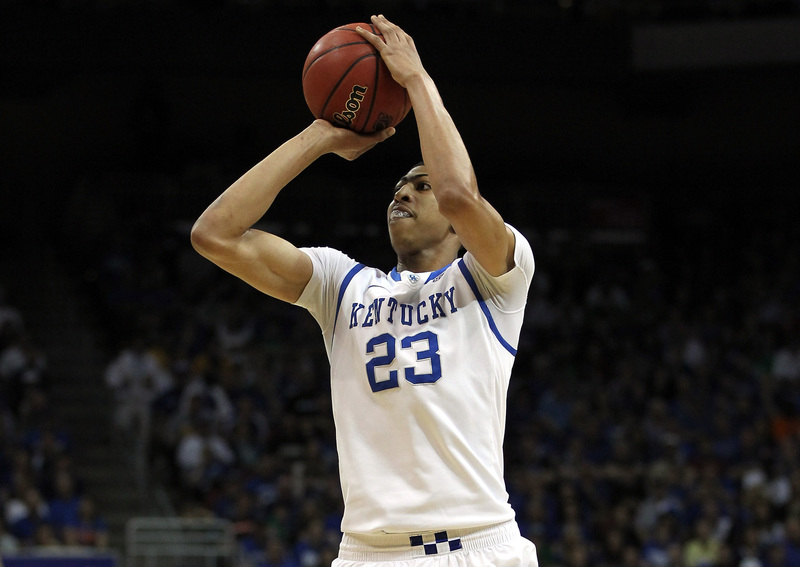 Davis was anything but exceptional on the offensive end against the Kansas Jayhawks during the national championship game. He was just one for 10 shooting (his first field goal came late in the game’s second half), four for six from the charity stripe, and finished with a measly six points. But the great players are the ones who find a way to make a difference even when their shots aren’t falling. And as we all know, the former Wooden Award winner is one of the greats. The Brow used his length, instincts, and basketball IQ to dictate the play on both ends of the floor, finishing the night with 16 rebounds (four offensive), five assists, three steals, and six blocks. Davis was named the Final Four’s Most Outstanding Player and Kentucky won the contest 67-59, giving their head coach the first championship of his career. Is it any wonder that this stud center made the starting lineup for the All-Time Calipari team? We think not. We live in an age when freshmen dominate the college basketball landscape. However, that doesn’t mean all of them are able to deal with the bright lights of the biggest stage. They are, after all, still just kids. That being said, these same rules hardly apply to The Brow. Especially when we’re talking about the show he put on during a 69-61 victory over Louisville in the national semifinal. Statistics courtesy of SR/College Basketball and ESPN.com.